Technical Workbenches Provide Versatility For Design, Testing, Service And Repair. 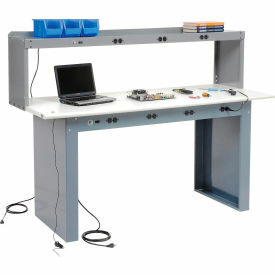 Technical Workbenches are made with tubular steel with solid side panels for long lasting durability. Horizontal support rails reinforce the work surface for test, service, repair and many quality control applications. Work surface includes backstop to retain contents. Lateral stringer provides added reinforcement and rigidity. 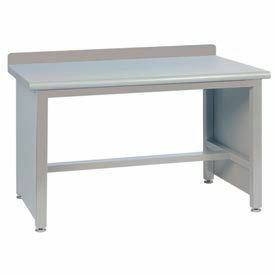 35-1/4"H work surface ensures comfort and safety during use. Choose between Butcher Block Top made of 1-3/4" thick hardwood with bullnose front edge or Plastic Laminate Square Edge Top that is 1-1/2" thick with bullnose front edge. Available in Light Gray and Bright Blue in 60" or 72" widths.